John Frum (also called John Brum, Jon Frum, or John From) is a figure associated with cargo cults on the island of Tanna in Vanuatu. He is often depicted as an American World War II serviceman who will bring wealth and prosperity to the people if they follow him. He is sometimes portrayed as black, sometimes as white. Quoting David Attenborough's report of an encounter: "'E look like you. 'E got white face. 'E tall man. 'E live 'long South America." 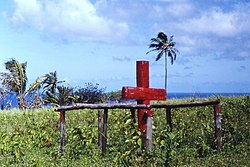 The religion centering on John Frum arose in the late 1930s, when Vanuatu was known as the New Hebrides, although there was a claim in 1949 that it had started in the 1910s. The movement was heavily influenced by existing religious practice in the Sulphur Bay area of Tanna, particularly the worship of Keraperamun, a god associated with Mount Tukosmera. In some versions of the story, a native man named Manehivi, using the alias "John Frum", began appearing among the native people of Tanna dressed in a Western-style coat and assuring the people he would bring them houses, clothes, food and transport. Others contend that John Frum was a kava-induced spirit vision. Said to be a manifestation of Keraperamun, this John Frum promised the dawn of a new age in which all white people, including missionaries, would depart the New Hebrides, leaving behind their goods and property for the native Melanesians. For this to happen, however, the people of Tanna had to reject all aspects of European society including money, Western education, Christianity and work on copra plantations, plus they had to return to traditional kastom (the Bislama language word for customs). In 1941, followers of John Frum rid themselves of their money in a frenzy of spending, left the missionary churches, schools, villages and plantations, and moved inland to participate in traditional feasts, dances and rituals. European colonial authorities sought to suppress the movement, at one point arresting a Tannese man who was calling himself John Frum, humiliating him publicly, imprisoning and ultimately exiling him along with other leaders of the cult to another island in the archipelago. Despite this effort, the movement gained popularity in the early 1940s, when 300,000 American troops were stationed in New Hebrides during World War II, bringing with them an enormous amount of supplies (or "cargo"). After the war and the departure of the Americans, followers of John Frum built symbolic landing strips to encourage American airplanes to land and bring them "cargo". Versions of the cult that emphasize the American connection interpret "John Frum" as a corruption of "John from (America)" (though it could mean John from anywhere) and credit the presence of African American soldiers for the idea that John Frum may be black. In 1957, a leader of the John Frum movement, Nakomaha, created the "Tanna Army", a non-violent ritualistic society that organised military-style parades of men whose faces were painted ritual colours and who wore white T-shirts with the letters "T-A USA" (Tanna Army USA). This parade takes place every year on February 15, the date on which followers believe John Frum will return, and which is observed as "John Frum Day" in Vanuatu. In the late 1970s, John Frum followers opposed the imminent creation of an independent, united nation of Vanuatu. They objected to a centralised government they feared would favor Western modernity and Christianity that would be detrimental to local customs. However, the John Frum movement has its own political party, led by Song Keaspai. The party celebrated its 50th anniversary on February 15, 2007. Chief Isaak Wan Nikiau, its leader, was quoted by the BBC from years past as saying that John Frum was "our God, our Jesus" and would eventually return. In December 2011, Radio New Zealand International reported that the "president" of the John Frum movement (and jointly of Nagriamel) was Thitam Goiset, a woman of Vietnamese origin and sister of businessman Dinh Van Than, despite the leadership of these movements having been "previously [...] held by high ranking male chiefs". In 2013, Thitam Goiset was sacked from her role as Vanuatu's ambassador to Russia amid evidence of corrupt activities. ^ a b c Guiart, Jean (1952). "John Frum Movement in Tanna Oceania" (PDF). 22 (3): 165–177. ^ "Jon Frum". jonfrumartfoundation.com. Retrieved 23 June 2017. ^ Trask, Steve (February 11, 2016). "The South Pacific island cult who worship the spirit of an American World War II soldier (in the hope he'll return with Coca-Cola, TVs and medicine)". Daily Mail Australia. Retrieved 26 June 2017. ^ Turnbull, Alex (February 15, 2008). "John Frum Day". Googlesightseeing. Google. Retrieved 2011-02-04. ^ "Vanuatu cargo cult marks 50 years". BBC News. 2007-02-15. Retrieved 2007-02-15. ^ "Vanuatu's ambassador to Russia sacked", ABC News Australia, 23 April 2013. ^ "Vanuatu anti-corruption lobby: Russia ambassador a business deal", Radio New Zealand, 16 January 2012. Rice, Edward (1974). John Frum He Come: Cargo Cults & Cargo Messiahs in the South Pacific. Garden City: Dorrance & Co. ISBN 0-385-00523-7. Jarvie, I. C. (1964). The Revolution in Anthropology. London: Routledge & Kegan Paul (reprinted 1967) pp. 61–63. Lindstrom, L. (1990.) "Big Men as Ancestors: Inspirations and Copyrights on Tanna (Vanuatu)". Ethnology, vol xxix no. 4. October. Raffaele, Paul (February 2006). "In John They Trust". Smithsonian. Smithsonian. Retrieved Nov 26, 2009.